You are a mammal. Your pet dogs and cats are mammals. An elephant is a mammal and so is a whale. When you learn about animals, the first you learn about are probably mammals. Not all mammals are made the same way. Most of the mammals you see will be placental. If you are in Australia you will see a lot of marsupials. Monotremes are tough to find. There aren't many of those left in the world. Monotremes were the first mammals. How do scientists know? They actually lay eggs. Monotremes are more closely related to reptiles than any other mammal. They have not yet evolved a way to have their babies live. Examples of monotremes are a duck-billed platypus and the spiny anteater. 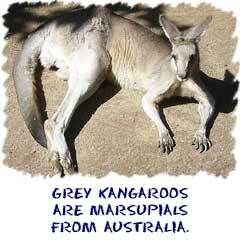 There are many more marsupials than monotremes. Kangaroos, koalas, bandicoots, and possums. You'll find a lot of them in Australia. Australia is an island continent. Because of its isolation, placental mammals didn't take hold in their ecosystems. Australia is like a mammalian time capsule. Marsupials are special mammals that give birth to their young live, but the babies mature in pouches. While they are in the pouch they suckle on the mother's milk for nourishment. 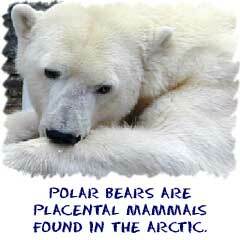 Placental mammals are the dominant form of mammal on the planet. Placental mammals deliver their young live and ready for action. Although the babies might still need some work, much of the basic development is done inside of the female's placenta. When the baby is born, it still needs some raising and education. Mammalian mothers will usually stick around and help in that learning process. There are no pouches. The baby must walk or be carried. Placental mammals are everywhere, even in the oceans. A group called cetaceans includes dolphins and whales. They are mammals that evolved and returned to the ocean. They still breathe air and even have tiny hairs like other mammals, but they live their whole lives in the water.